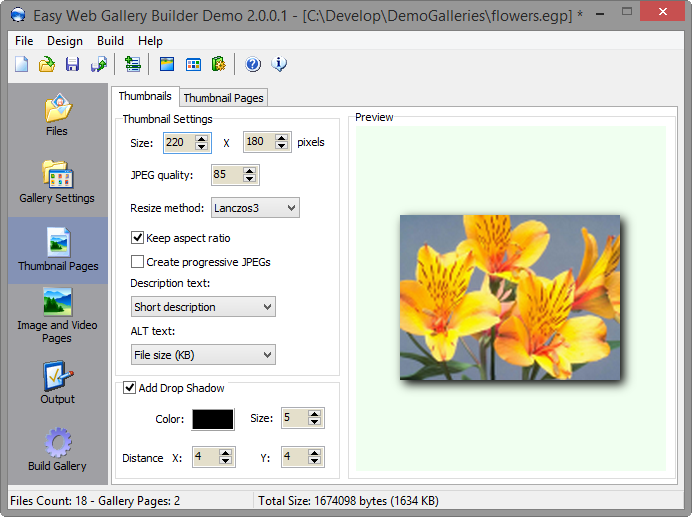 Easy Web Gallery Builder creates dazzling HTML image galleries for online and offline viewing. It will not only generate the HTML code for the galleries, but also convert the images to a format supported by the web browsers and generate high quality thumbnails of the full-sized images in order to load faster and save bandwidth. The supported input image formats is huge (hundreds of image formats) and includes also camera RAW formats. Virtually all the settings of the gallery can be customized including titles, descriptions, colors, alignments, thumbnail sizes and many more. The watermarking feature can be used to add image or text watermark to every image. This new release includes support for the latest Windows Vista/7/8/8.1/10 operating systems and adds full Unicode support. 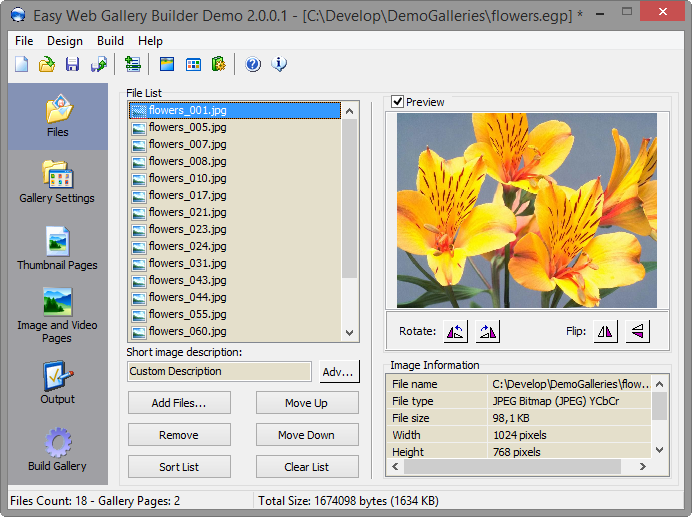 This means that the generated galleries can contain text in multiple languages simultaneously. Some small bug fixes are also applied. This entry was posted in Easy Web Gallery Builder and tagged Adobe Bridge Cc Web Gallery, Adobe Lightroom Web Gallery, Bootstrap Gallery Template, Bootstrap Image Gallery Example, Bootstrap Image Gallery Lightbox, Bootstrap Image Gallery Slider, Bootstrap Thumbnail Class, Bootstrap Thumbnail Gallery, Bootstrap Thumbnail Grid, Css Image Gallery With Thumbnails, Css Image Thumbnail Gallery, Free Online Photo Gallery, Free Photo Gallery, Free Photo Gallery For Website, How To Make A Photo Gallery In Html And Css, Html Gallery Template, Html Photo Gallery Code, Html5 Image Gallery, Html5 Photo Gallery, Image Gallery Html, Image Gallery Html Css, Image Gallery Html Template, Image Gallery Jquery, Lightroom Web Gallery, Lightroom Web Gallery Plugin, Lightroom Web Gallery Templates Html5, Photo Gallery For Website Free Download, Photo Gallery For Website Html Code, Photo Gallery Html Code Free, Photo Gallery Website Template, Simple Css Image Gallery on March 23, 2016 by MindGems Support.